Quench Lyte is an electrolyte and trace mineral supplement for deficiencies in horses to aid in the prevention of dehydration and electrolyte depletion associated with stress conditions. 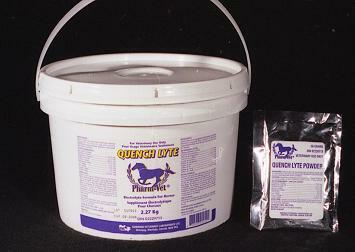 Quench Lyte may be administered in the horses feed or drinking water. Locate scoop inside package. One scoop equals 28grams. 450Kg Horses: 300 grams (10 3/4 scoops) per 480 litters of drinking water, or 56 gms (2 scoops) in the horse’s daily feed ration in place of regular salt (Individual treatment), as long as recommended by a veterinarian. Your average horse derives its needed electrolytes from a balanced diet of high quality feed and good quality hay. If your horse does a bit of work, but it rarely sweats, then you will be able to supply a bit of supplementation simply with the installation of a salt lick which the animal may use as free choice.When a horse sweats it loses salts such as sodium, chloride and potassium. This depletion of a horse's natural electrolyte balance can cause muscle stiffness, tiredness and colic symptoms that can be potentially life threatening. Administering electrolytes before, during and immediately after heavy work, may replace lost electrolytes and prevent dehydration. It is important to realize that electrolytes which are vital to the body’s functioning are lost during times that the animals sweats, and if your animal exercises for prolonged periods of time, or if the temperatures are high enough during even moderate exercise to cause it to sweat, you will need to offer supplementation to permit the animal to make up for the electrolytes it lost. Most horses under a light work load and eating a balanced diet with either loose salt (sodium chloride) or a salt block available will not need electrolyte supplements. But horses participating in sports like endurance riding or eventing may benefit from electrolytes. Some people may supplement with electrolytes during extremely hot weather, when horses are sweating just standing still. While many horse aficionados are not entirely certain what electrolytes are, their absolute necessity for a healthy horse is not disputed. To those who are not familiar with them, it is important to understand that electrolytes are nothing more than minerals which are already present in the animal’s body, albeit in a slightly different form. Cellular function – which is driven by electrical charges – is controlled by electrolytes. When too many of them are lost through sweat, the cellular functions are inhibited. Thus, supplementation is the process of reintroducing into the horse’s system the minerals it has lost, and thereby cellular functionality is restored. Obviously it is the ideal to replace the amounts of electrolytes that are lost during exercise. To this end, it is important to purchase supplements that actually contain the correct minerals in their proper quantities. Generally speaking, any electrolyte supplement ought to consist of at least 50 percent chloride, 20 percent sodium, 15 percent of potassium, and only about one percent of other trace minerals, such as calcium and also magnesium. Mix the supplement into the horse’s feed – some may be mixed into the water – and perhaps even add a bit of sugar (about five percent of dextrose) to increase palatability and also digestibility in the gut. Some horse owners report that their animals will not eat feed mixed with electrolyte supplements, and for those with the more picky horses there are other solutions available. You may therefore need to be a bit more creative, such as making a palatable mash of the feed, supplement, and beet pulp. Conversely, you may also mix electrolytes with applesauce or yogurt to give to your horse as a treat. No matter how you present the animal with the supplemented feed, it is imperative that the animals will drink one gallon of water to offset each ounce of consumed electrolytes. Failure to ensure this will result in severe dehydration. For those ready to supplement, keep in mind that you only need supplementation during the days that your horse will sweat. Thus, if you know that your animal will attend an event three days hence, it is a good idea to begin supplementation now and even continue it until about two days after the event. Many horse owners find that only about two ounces of supplement are needed for most working situations, while two ounces should be supplemented for each hour of strenuous activity that takes place in hot conditions. Prior to competitions the use of electrolyte supplementation will prevent early tiring, and some horse owners have actually reported that they have noticed a slight advantage of performance. Yet be careful not to overdo the supplementation since they are simply excreted. Additionally, do not forget to monitor your animal’s water intake since the water is the key to creating a solution in the gut that can be absorbed by the blood stream. 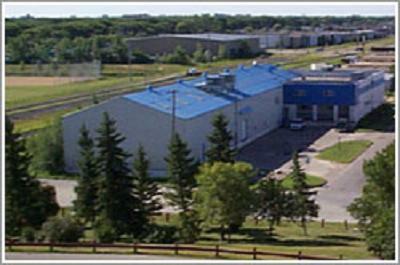 There are several types of electrolytes formulated especially for horses. Electrolytes made for cattle or other livestock may be unsuitable. Also, electrolytes with a high proportion of sugars are not suitable. If you are planning to compete in a sport like endurance riding get advice from your equine veterinarian and seasoned competitors before administering electrolytes.